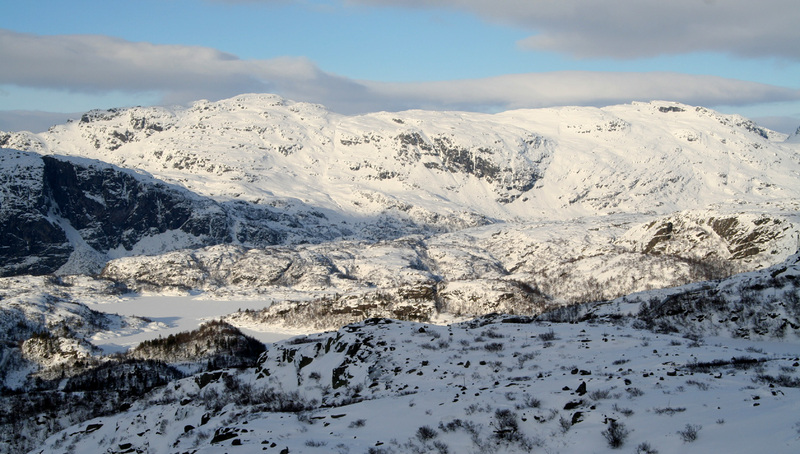 How to get there: From Bergen, this is a rather long drive, 217 kilometer to be precise. The first objective is to drive to Sauda. The best option is likely to be E-39 south, then E-134 north-east to Ølen, connecting south on Hwy 514 to Hwy. 46 in Sandeid, then Hwy. 46 to Ropeid and finally Hwy. 520 to Sauda. One may also consider driving via Odda, however Hwy. 520 is closed in winter so this is less attractive at this time of year. From the traffic circle and Esso gas station in Sauda, continue about 18.5 kilometer along Hwy. 520 as it climbs an impressive gorge. Near this point, there is a road that goes right. Continue along this road for 3.2 kilometer to a house named Pålsbu. Park here, the elevation is 567 meter and the location is N59:41.584, E006:34.079. Route description: From the trailhead, contine down the road and cross the gate (that was locked when I was there.) Cross above the tunnel that carries water into the lake Dalvatnet (536-550). Continue until near a small wooden bridge on your right, do not cross this one. 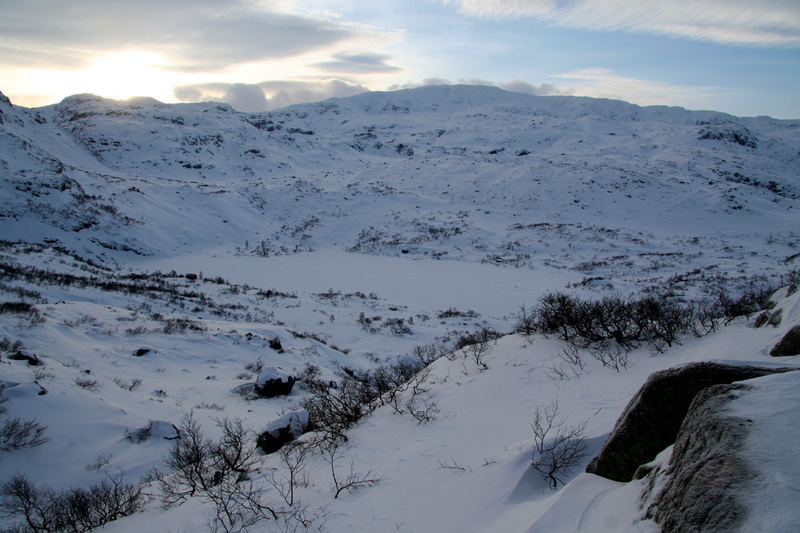 Make a left and climb the gorge that used to carry water from the higher lake Finnflotvatnet (726-743). 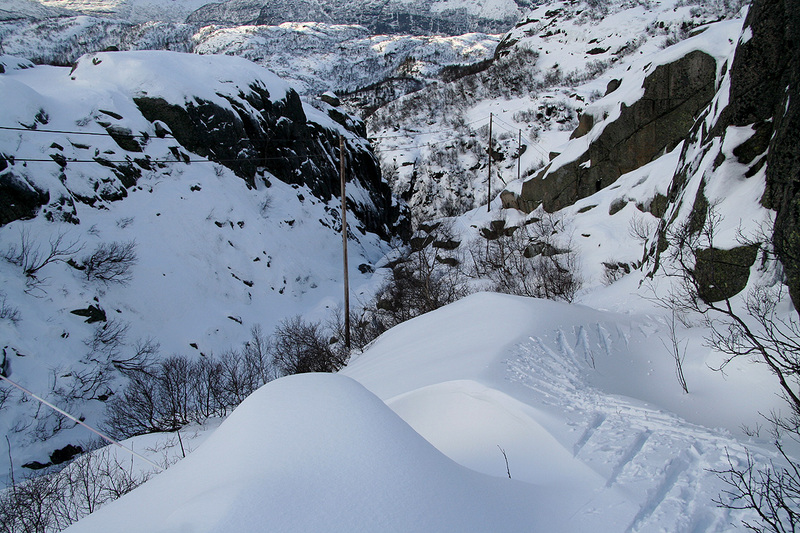 The terrain here is a bit complex for skiing, perhaps more so when the snow depth is still limited. 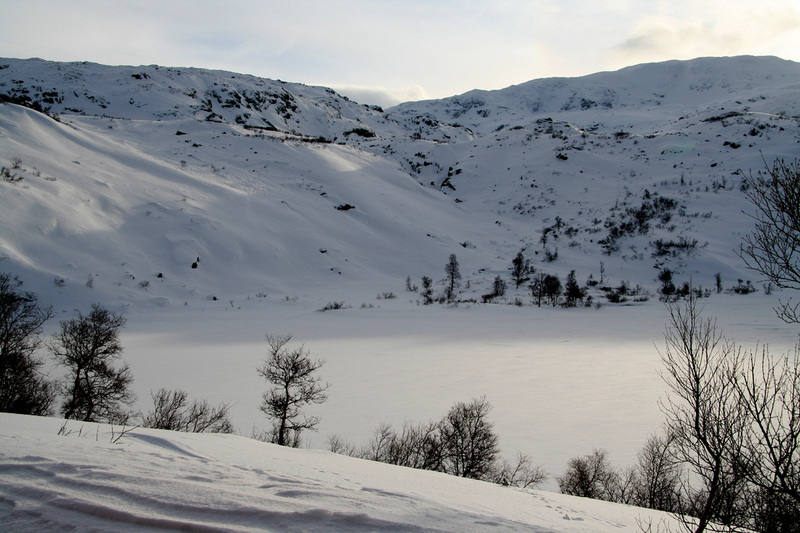 Carefully descend onto the lake (in winter) and ski to its south-west end (right). This lake serves a hydro electric powerplant, thus its water level is highly variable. A distinct gully is coming steeply down at the end of the lake. The route heads up this gully. Next, one either descends to lake 784, then proceeds south-east up to lake 814, or (as I did) climb left to about 900 meter, then descend directly to the mountain cabin next to lake 814. 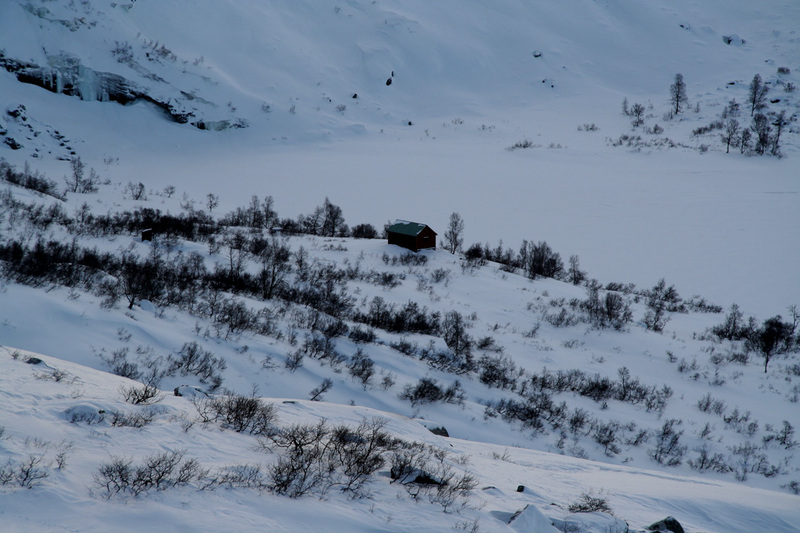 From this hut, cross the lake and head up on easy terrain aiming more or less on the towering Skaulen that is now visible. Continue up this easy slope, and climb left of a small knoll, do not take the first left turn, but rather continue just below a sharp cliff, then enter an interesting valley with many large boulders. Higher up, this valley opens up and turns more left. A steeper gully is straight ahead. There is also another gully going right beyond a very noticeable cliff. 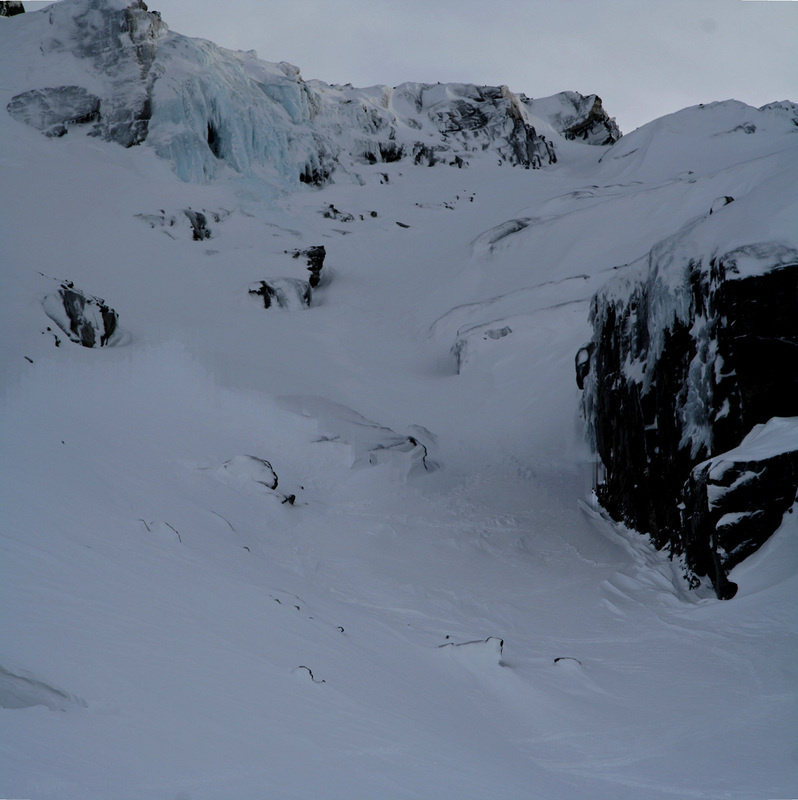 I skied this second gully, but with hard crust, this was about as steeply as I can go without getting nervous. The first gully may actually be a better choice. 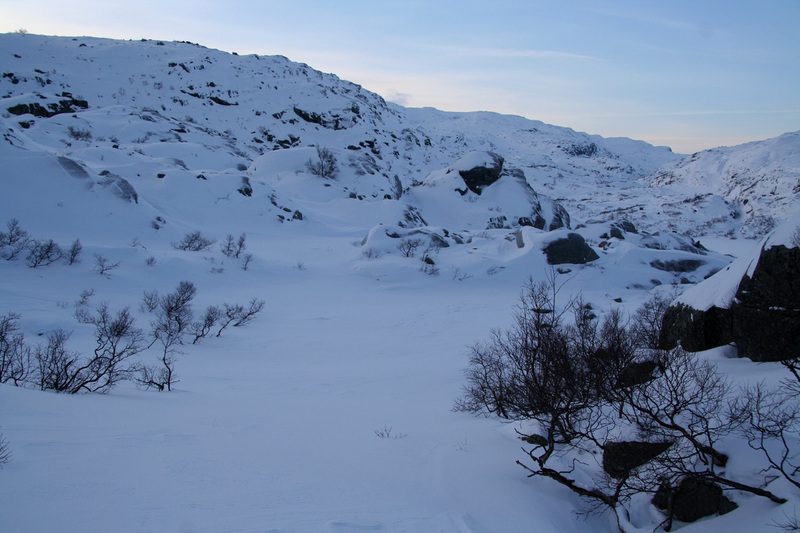 Both these slopes may be difficult without crampons if the snow or hard crust turns into ice. The gully I skied (actually carefully side stepped up) was definitely the crux of this route. On top of the gully, turn right and climb the long (but pretty easy) summitridge. Comments: I did this climb solo. After spending the night at Kløver hotel (downtown Sauda), I got on my way from the trailhead at 0900. The summit was reached at 1230 and I was back at the car at 1445. There was not any sign of other skiers. 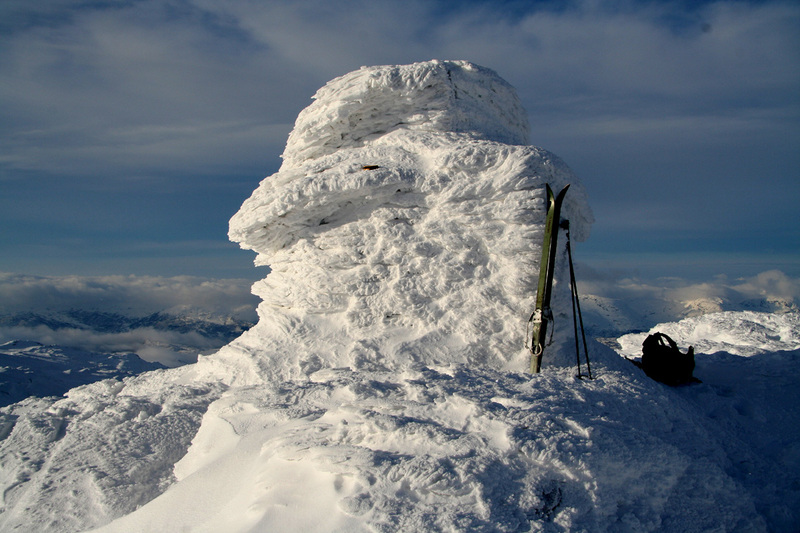 There was no wind at 900 meter, but strong gale force wind at the summit ridge. I stayed perhaps 10 minutes at the summit and enjoyed a nice break by the mountain cabin near lake 814 on my return. The terrain is best described as "rugged", big boulders are scattered around and the route involved several moderately steep gullies. This is a pretty big mountain. The views from the summit are extensive, a definite feeling of beeing on top of a major mountain. The weather was not as good as the forecast had indicated, but one cannot complain, a mix of high clouds and some sunshine. Thanks are due to Øyvind Thiem for giving expert advice on the route. The first gully, looking back just below lake Finnflotvatnet. Complex terrain, this is after the second gully. Tindane, looking back west across Hwy. 520. The route ahead. This picture is taken from the cabin near lake 814. Skaulen is visible to the right. The crux gully, the upper section is considerably steeper than it looks. Panorama I, south-west towards west. 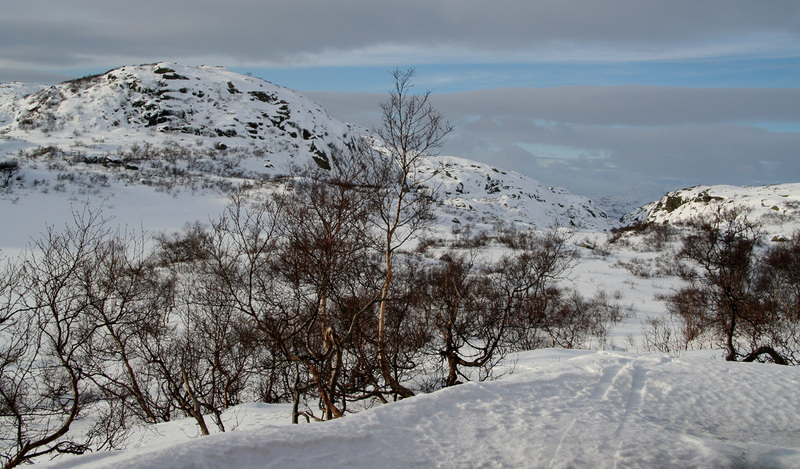 The very tempting traverse route down to Maldal, however time and weather did not permit this in January. Panorama I, more zoom the view is west. Panorama II, the view is north.